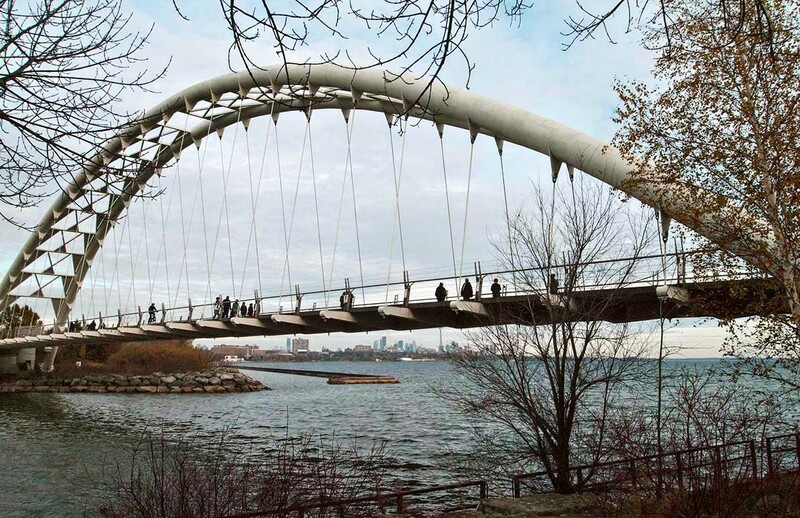 Located at the mouth of the Humber River at Lake Ontario, this is a bridge which expresses an awareness of its site and its history in every aspect of its design. It is a bridge in all directions. Horizontally it takes us from one river bank to the other, and visually from the deck it takes us vertically both down to the water and up at the sky superimposed with Thunderbird imagery. From the bridge we see the contemporary skyline of Toronto while standing at the ancient site of settlement of original inhabitants, surrounded by their symbols and imagery. Toronto engineers, designers and artists collaborated on this award-winning structure. Alexander Moyle is the artist responsible for the etched stainless steel snakes embedded in the base supports of the arch. (In my neighbourhood we are familiar with him from his whimsical green birdhouse.) It adds visual richness even for those not using it, such as passers-by in boats or cars. Its scale is inspiring and human. It is perfectly functional, and also contributes to our consciousness of our exact location and history. It is everything good public infrastructure should be. See more about the artists and designers here and here.